It’s pantry reveal day! You guys might have seen on Instagram that I have been working on organizing our kitchen pantry for quite some time now. Since we moved into our new house, I have been trying to be intentional about the decor and products I bring into this abode. And the kitchen pantry project has been no different. 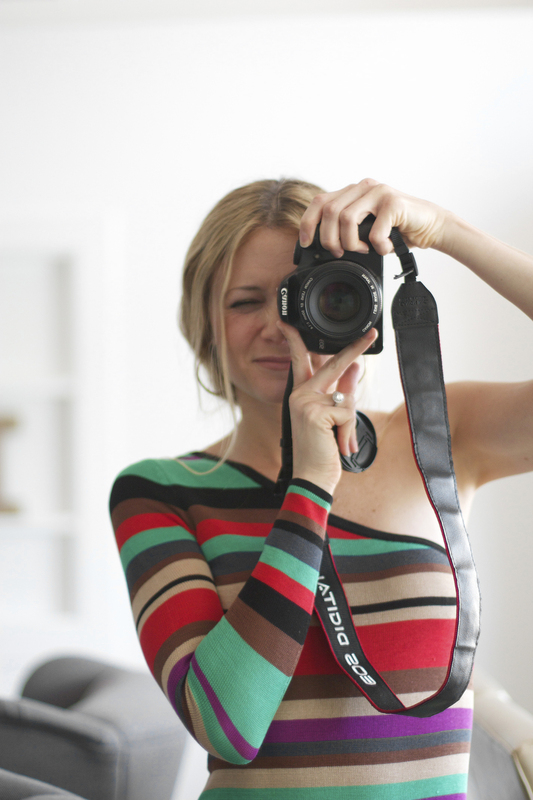 I tried to think through every functional and aesthetic detail while I was working and reworking the space. My goal for the pantry was to make it look less like a sea of organized jars and more like a set of styled shelves. 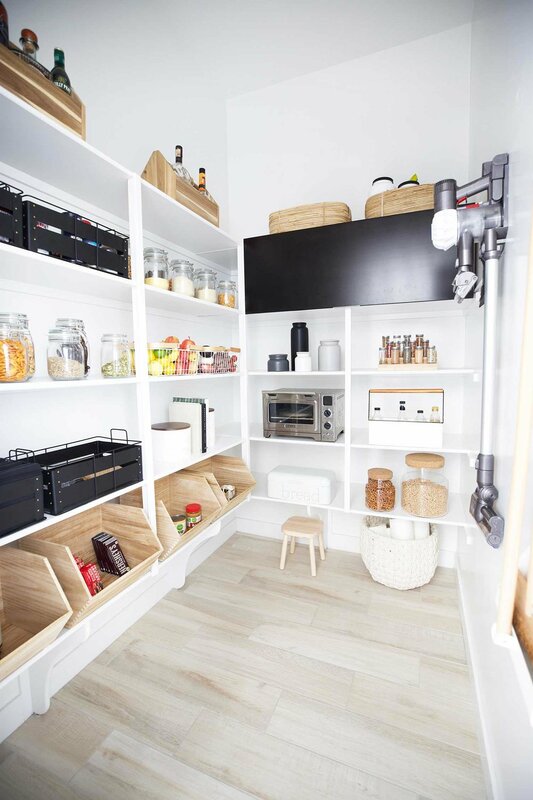 Hopefully I achieved these pantry goals, but I’ll let you be the judge. Please let me know your thoughts in the comments below. 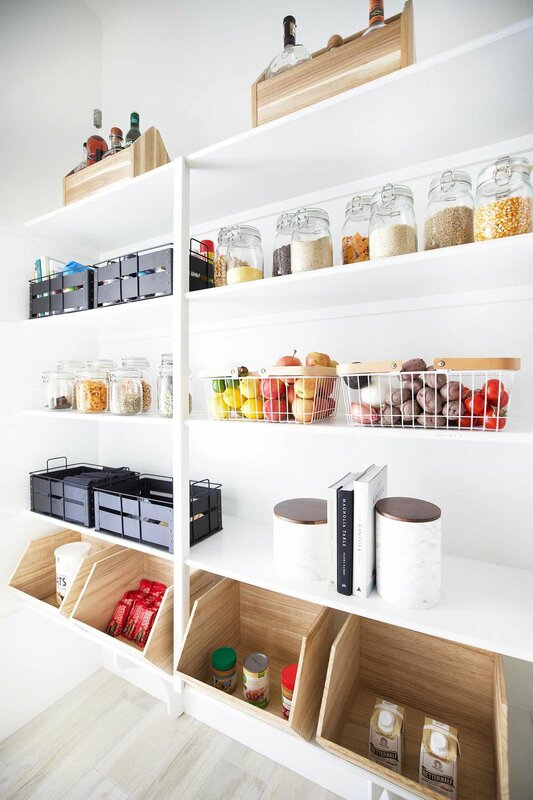 In the meantime, you will find a step-by-step on how to organize your pantry, a list of some things to consider when organizing your pantry, and a checklist for creating an organized but stylish space. Hope you find it helpful! Step one is to clean out your pantry. Throw out expired spices and foods and try to eliminate any extras you don’t need … Marie Kondo that s&*t! You might think that I took some food out of our pantry to style it for this post, but this is actually real life over here. We don’t store a lot of extra food in our pantry. I am not a bulk buyer. It gives me serious anxiety to think about where I have to store extra items, but I realize not everyone is the same. So I just encourage you to eliminate buying extras when possible. 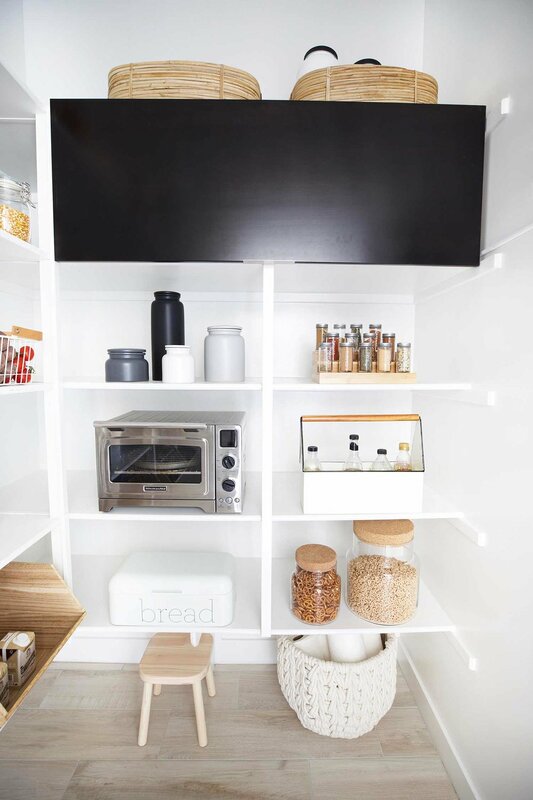 The less you have to store, the easier it is to keep an organized pantry. Mike and I have also found that we don’t waste as much food when we don’t buy in bulk. What kind of container would work best for this item? Do these items need to be out of reach of children? How often do I use these items? Answering questions like these will help you decide how and where you want to store items. Step three is to make a plan. After taking inventory of what I had in the pantry, I created a loose plan of what I wanted to. I picked out the storage items I thought would work best. I then created a mockup in photoshop of where I wanted to place everything. I realize not everyone uses photoshop, but even sketching it out on a piece of paper will help. Keep in mind not only functionality but also aesthetics. Try to find the best compromise between the two. Step four is to execute your vision. You may need to work and rework the space after you use it for a bit. You might find that items you are using everyday are out of reach or your kiddos are constantly getting into things that are off limits. I recommend keeping the tags on bins for a couple of weeks, so that you can return anything that isn’t working. 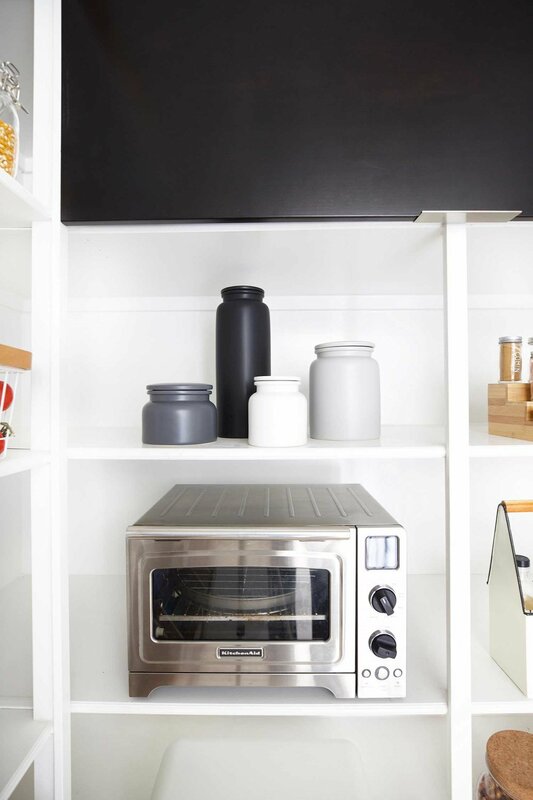 Moving the countertop oven into the pantry was one of the best things we have done for our kitchen. We use the countertop oven multiple times a day, so there was no question I was going to get rid of it. The problem was it took up so much counter space in our kitchen, and we don’t have a lot of counter to begin with. So we had an electrician move an outlet into the pantry for the oven. Perhaps you don’t have a countertop oven, but you have another small appliance that sits on your kitchen counter. Consider moving it into the pantry. It’s a great way to free up that coveted countertop space in your kitchen. While in your kitchen, having easy access to a vacuum and/or broom is crucial especially if you have a three and two year old at home. 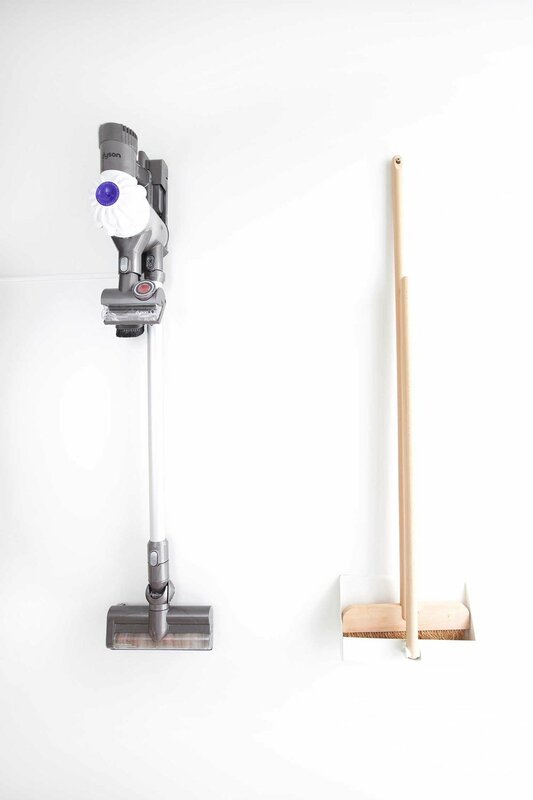 Consider storing a small vacuum and/or broom in your pantry. We are so happy we did. 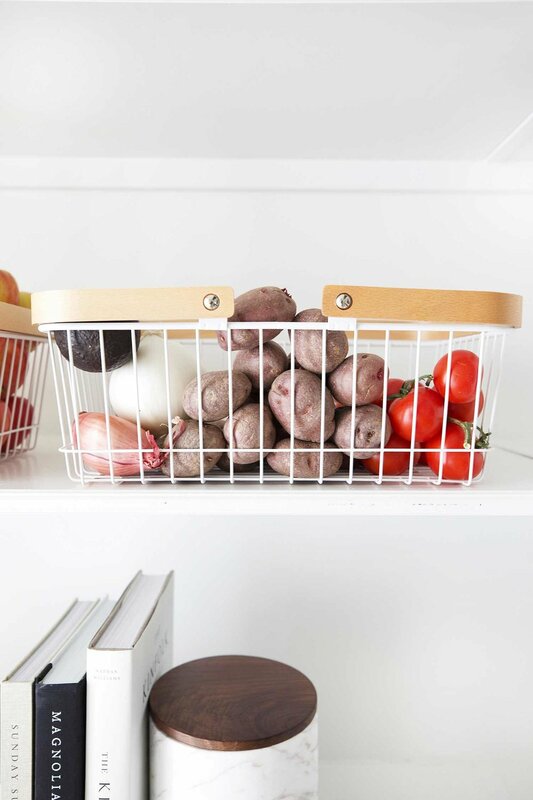 Corralling like items such as produce into bins helps minimize the chaos of a pantry. When choosing bins, consider if you want the items inside to show or not. Produce is great to show off, but you may not want to show off random cans. Behind that cabinet door you will find our modem, router, and receiver. Our builder gave us the option to place our electronics in the pantry, so we didn’t have to find a place to store them under the TV. We are happy we selected this option; however, we were left with ugly electronics in the pantry. To hide the mess, we used an extra kitchen cabinet door and attached it to the top of the cabinet with hinges. We also installed lift support hinges on either side of the cabinet to keep the door elevated when we need to get in there. Since the left side of the cabinet was open we installed a small piece of wood so we had something to secure the support hinges to on that side. Symmetry is very important when organizing your pantry. I recommend repeating the same bins or canisters in sets of two or four to create symmetry. I don’t recommend getting too carried away with repeating storage items. If you have 10 of the same bins, your pantry starts to look more like a warehouse than a styled shelves. I like to put snacks and items we buy regularly such as oats, nuts, and crackers into jars. It makes it easy to see what you have, and if you buy them regularly you can have a designated jar for each item. Since I was going for that “styled shelfie” look, I used beautiful cookbooks and canisters to decorate the pantry. These items are both useful and stylish. I recommend putting powders like flour into canisters that are not see through. Flour residue tends to stick to the sides of glass jars and ends up looking messy. I like to stay within a decided color palette when choosing my storage containers. Here I went with a black, white, and gray color palette with natural wood accents. If there are too many colors going on in your pantry it can start to feel chaotic. Alright that’s it! I hope you enjoyed the tour of my newly organized pantry and got some good tips along the way for organizing your own pantry. Please let me know if you have any questions in the comments. And in the meantime, you might be interested in my post on how I organized our “everything cabinet.” Thank you so much for stopping by!